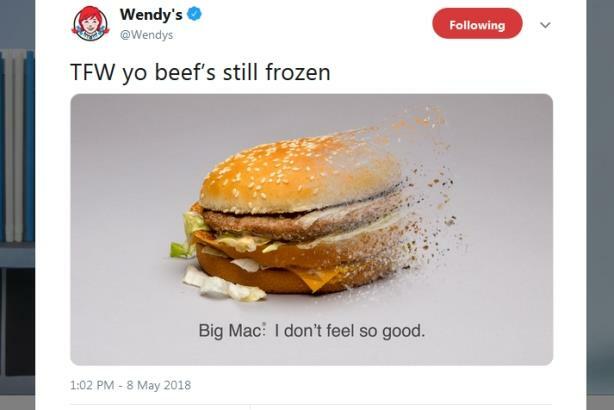 Should McDonald's give Wendy's a taste of its own sassy social media medicine? McDonald's never fights back when trolled by competitors. Should it? McDonald’s never puts up its dukes when picked on by competitors such as Wendy’s or Burger King. Jano Cabrera, SVP of U.S. comms, global media, and PR for McDonald's, said that the chain goes by the principle that no fighter in the history of boxing has ever won simply by blocking punches. "You have to go on the offense," Cabrera told PRWeek. "There has to be something you stand for that is appealing. What is the case, proactively, you are making?" But doesn’t a part of you want to see McDonald’s get back at the bullies in an all-out fast food fisticuffs? Should McDonald’s give Wendy’s and Burger King a taste of their own sassy social media medicine?